Before reading on this is a reader warning – Listeners to Globecast Radio and the ALMS Radio Web may be subjected, possibly more than once, to a blow by blow repeat performance of the race report below. IMSA Officials have been alerted to warn the ALMS drivers at their Laguna Seca briefing that John Hindhaugh is likely to be offering driving tips and ‘advice’ before the start of the forthcoming final round of the ALMS. ALMS and Radio Le Mans frontman John Hindhaugh claimed his first class victory in the Heritage Grand Touring Car Championship at Brands Hatch over the weekend of September 24/25th. 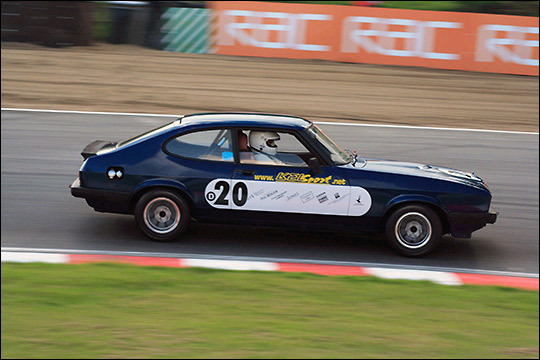 The ODL Securities/Quintus Events Ford Capri was entered in Class D - for sports saloons of the 1960s and 70s. Apart from a brief brush at Paddock with multiple Touring Car Champ Andy Rouse in the Camaro, for once qualifying was relatively unremarkable with Hindhaugh clocking a creditable 1.00.7 for the Indy circuit. With 32 cars entered on the 1.2 mile circuit the biggest problem was traffic. "I haven't looked in my mirror as much since I had 11 points on my road licence" said Hindy after the session. 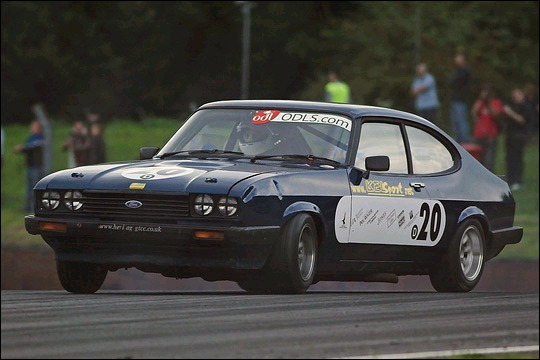 Unfortunately race one saw a recurrence of the oil smoke problem that has plagued the Capri since its return to racing after a five year lay-off. After just 3 laps the car was brought into the pits to answer a black and orange flag, "I can't blame the officials" said Hindhaugh, "it's not much oil but its getting onto the manifold and creating a lot of smoke. It looks like a chase scene from a Bond movie out there! 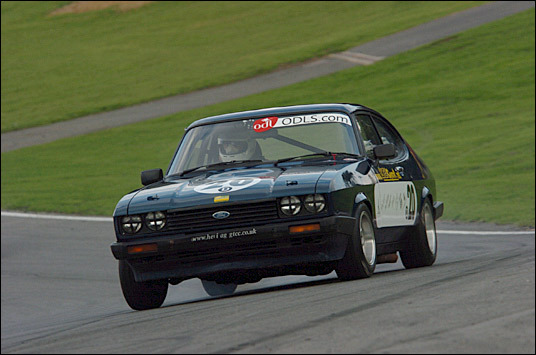 With Hindhaugh on commentary duty for ITV Sport and Motors TV it was left to the capable Kelsport team to get the car prepared for the Sunday event. The problem was traced to simple overfilling of the oil system so it was all systems go for race two. The Capri got away well from the rolling start and made 3 or 4 places up into Paddock, up the hill to Druids and more jockeying for position put the Capri around the outside of one of the Mustangs and even Mike Youles in the Lotus 26R was in the Ford's mirrors (as opposed to the fluffy dice hanging from the mirror which can just be spotted in the image below!). Along Bottom Straight on lap 1 all hell broke loose as an ambitious move by one of the Camaros pitched the hapless John Roades in the Mini head-on into the tyres. As the Mini bounced back onto the track Hindy just squeezed through almost putting Youles onto the grass. Although the safety car was deployed it was obvious that the race could not continue. Whilst on the grid for the red flag, the Capri started dropping oil. Hindhaugh headed to the pits where long-suffering mechanic Tony managed to trace the problem to a rocker box gasket. After negotiation with the officials and some remedial work during the stoppage, Hindhaugh rejoined from the pitlane as the cars rolled off on the green flag lap. One of the Astons had failed to restart leaving a big gap in the grid. The pit exit marshal, believing the field had gone through waved out Hindy - into 12th Place! but they are so much quicker on the straights." " I saw the class competition a couple of times in the mirror early on and I was expecting the Minis and the other Class D cars to catch me up but I managed to pull out a little. Once I passed half distance I decided to just get the car home and get a finish and a signature - also I was getting tired as the car has no power steering." The Capri was very popular with the crowd although Hindhaugh admits that it was nearly too entertaining. " When I saw the last lap board I thought I would hang it out at Paddock and got on the power really early. As planned the back end came around - very cool - except that it rather got away from me on the exit and I thought I was going to bin it. The rest of the lap was much more sedate!" 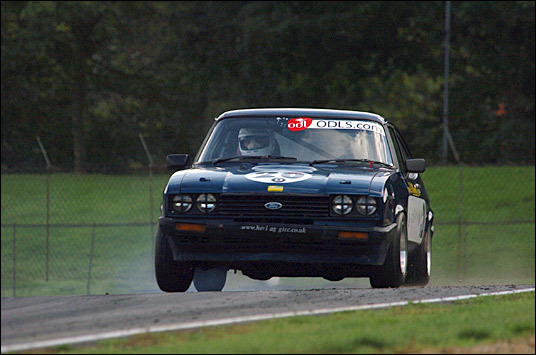 Unknown to Hindy, the competition behind him was hitting problems and by the chequered flag the ODL Securities/Quintus Events Ford was 18th and the class winner.
" Brilliant effort by the whole team - now I need a drive in the BritCar winter series... any takers?"